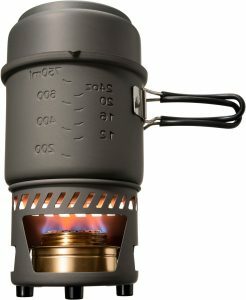 This camping stove and cookware has retractable handle with integrated heat exchanger which guarantees high power and a reduced energy consumption, ideal for bushcraft and stealth camping. Light, easy to pack into your back pack and great for boiling and cooking. The stove dimensions and statistics are: size packaged: 14.7 x 12.8 cm Weight: 417 g Volume: 985 ml and 470 ml.